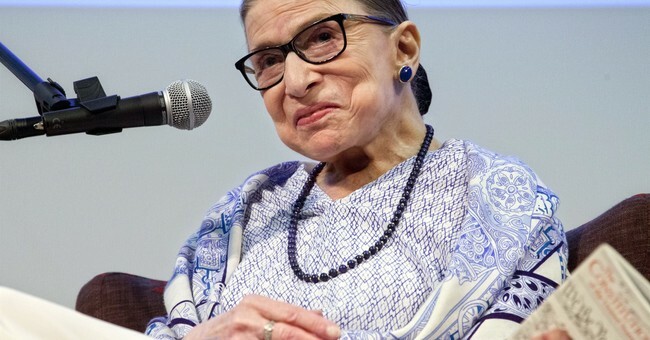 Supreme Court Justice Ruth Bader Ginsburg discussed her future on the bench Sunday, saying she hopes to remain in her position for another five years. Ginsburg made the remark in Manhattan after the performance of “The Originalist,” a play about the late Justice Antonin Scalia. "If I had my choice of dissenters when I was writing for the court, it would be Justice Scalia," Ginsburg said, relaying that her conversations with Scalia would help her develop her arguments. "Sometimes it was like a ping-pong game." The associate justice’s name was trending on Twitter over the comments Sunday night, leading some liberals to initially fear the worst. Saw Ruth Bader Ginsburg trending & I was on my way to the hospital to donate all my organs to keep her alive. Then was relieved to see that she would be here another 5 years. I just saw #RuthBaderGinsburg trending on Twitter and my heart stopped. It's not what you think! She's gonna serve 5 more years! This is not the first time Ginsburg has said she has no plans to step down anytime soon. There are also reports she's hired law clerks through 2020, making it clear she plans to stay on the job for at least a couple more years.